According to local Minnesota lore, in 1885 a reporter from New York traveled to frosty St. Paul and was so turned off by the cold he called it “another Siberia, unfit for human habitation.” To prove the New Yorker wrong, St. Paul’s civic leaders decided to put on a spectacular winter fair to celebrate their state’s winter charms. That festival’s success spawned an annual event, the Saint Paul Winter Carnival, which is now the nation’s oldest and largest of its kind in the U.S., attracting more than 100,000 visitors a year. This winter, why not follow St. Paul’s lead and get outside to make the most of the snow and cold by attending one of the many winter-themed festivals in the U.S. and around world? From massive citywide carnivals like St. Paul’s to small-town ice-sculpting competitions and sporting events, you’ll find plenty of options to keep you busy. The historic Plains of Abraham and cobblestone streets of Old Quebec play host to the Quebec Winter Carnival, the biggest winter carnival in the world and the third-biggest carnival of any kind after New Orleans’ Mardi Gras and Rio’s Carnival. During this 17-day festival, nearly one million visitors descend on the city to take part in more than 300 events. Some of the Quebec Winter Carnival highlights include two huge nighttime parades, an international snow-sculpting competition, an ice palace in the Place Desjardins, and unusual sporting events such as a canoe race across the partially frozen St. Lawrence. The Carnival is bookended by opening and closing ceremonies, and activities such as skiing, ice fishing, snow rafting, sleigh riding, and ice skating are available around the city. Most of the events are free, although there is a small charge for some activities. While you’re in town, be sure to pick up a souvenir doll or pin of Bonhomme, the Carnival’s ubiquitous snowman mascot, and try a warm mug of Caribou, a zesty Carnival drink made of brandy, vodka, sherry, and port. The resort glitterati of St. Moritz, Switzerland, love horse racing so much they see no reason to give it up, even in winter. In fact, winter gives them reason to try a whole other racing spectacle: “skijöring”—a race in which riders on skis are pulled by thoroughbreds galloping 35 mph. 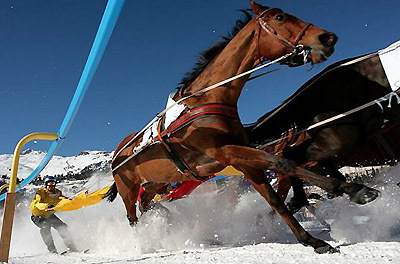 During White Turf (German website only), skijöring races are held on three consecutive Sundays in February. Thousands of spectators converge on the thickly frozen lake of St. Mortiz to watch the races and drink champagne in the shadow of the Engadine Alps. Riders also compete in standard flat races and trotting races where drivers are pulled in tiny sleighs. Besides racing, there’s also a children’s play area, live performers, an art tent, and culinary offerings. There’s a charge of 16 Swiss francs (about $13; see xe.com for current exchange rates) to watch the races; grandstand tickets cost 30 to 50 Swiss francs ($25 to $41). Go to StMoritz.ch to read about the event in English. Of all ice-sculpting competitions around the world, the World Ice Art Championships in Fairbanks, Alaska, is likely the biggest, using more ice and attracting more competitors than any other annual event. It helps that frigid Fairbanks, located just 125 miles from the Artic Circle, naturally produces some of the highest quality carving ice around, which it has shipped to carvers as far away as Israel. About 100 ice artists from around the world compete in two main competitions, the Single-Block Classic, which runs between February 27 and March 1, and the Multi-Block Classic, which runs March 4 to 9. In the first competition, the sculptors must work with a single four-ton block of ice; in the second, artists construct a sculpture using 10 blocks weighing a total of about 22 tons. Spectators can watch the artists at work and then view the finished pieces throughout the monthlong event. There’s also a junior sculpting competition, an ice park for kids, and a skating rink. Admission costs $8 per adult. This winter, you don’t have to travel to the high Arctic to see world-class dog sled races: top dogs and their mushers are coming to two of the most popular ski towns in the West for the eight-day International Pedigree Stage Stop Sled Dog Race (IPSSSDR). The race starts in Jackson Hole, Wyoming, where about 30 12-dog sled teams driven by professional mushers from around the world head out on a 352-mile journey to Park City, Utah. Unlike the more well-known Iditarod, which is a race to the finish with stops only at mandatory checkpoints, the IPSSSDR is run in eight stages with overnight stays in towns along the route (the organizers liken it to a “doggie Tour de France”), which is easier on the dogs. Spectators are welcomed to cheer on the dogs in Jackson and Park City as well as the seven other small Wyoming communities where the teams overnight: Lander, Cora, Pinedale, Big Piney/Marbleton, Alpine, Kemmerer/Diamondville, and Evanston. There’s a kick-off event in Jackson with fireworks, a torchlight parade, and live entertainment, and the other towns hosting the racers are planning festivities like banquets and snowshoe softball games. It’s free to watch the race but there may be a small charge to eat at the town dinners. Faithful ice reproductions of historic structures like Angkor Wat and five-story-tall Pokemon snow sculptures are just a few of the sights you may see at the Sapporo Snow Festival, the biggest winter event in Japan. During the event, more than 300 ice and snow sculptures carved by Japanese and international teams are displayed in three sites throughout the city of Sapporo on the northern island of Hokkaido. The mile-long Odori Park is lined with more than 200 of the biggest snow sculptures—some measuring up to 50 feet high and 80 feet long—while the Susukino entertainment district will hold about 100 ice sculptures. Popular sculpture designs include anime characters, famous buildings, and movie scenes. Snow slides, mazes, and other kid-friendly attractions will be constructed in the Sato-Land amusement park. The event is free. When planners in St. Paul went about creating their carnival, they also fabricated a fantastic myth about the carnival’s origin that still permeates the carnival events today: King Boreas, the “King of the Winds,” came upon frozen Minnesota in his travels and was so taken by its beauty that he made it his earthly capital, proclaiming the St. Paul Winter Carnival to celebrate its glory. King Boreas and his companions still make many appearances at carnival events, including the opening Grand Day Parade, the Royal Coronation and Ball, and the closing Torchlight Parade. However, there are dozens of other individual events and attractions. You shouldn’t miss the giant snow sculpture (projected to be the biggest in the history of the event this year), the ice maze, a dog sled rally that will feature an appearance by the Jamaican dog sled team, and parades held on each Saturday. The local Pioneer Press newspaper is also sponsoring a citywide treasure hunt during the carnival (clues will be provided each day in the paper and online) with a grand prize of $10,000. Some of the events are free while others charge a small fee. However, if you purchase an official St. Paul Winter Carnival Button for $5, you’ll receive free or discounted admission to many events that charge. Buttons can be purchased in retail locations throughout the city. The spectacular Fairmont Chateau Lake Louise in Alberta’s Banff National Park is the setting for Lake Louise’s annual Ice Magic International Ice Sculpture competition. On the first day of the event, about 10 teams of carvers are given 15 blocks of ice, each weighing 300 pounds, that they must use to carve an ice sculpture. Over the course of the weekend, you can watch the carvers at work and cast a vote for your favorite to win the People’s Choice Award. Sunday afternoon, judges hand out awards to the top three sculptures, plus the Carver’s and People’s Choice Awards. Other activities are scheduled around the Fairmont throughout the competition. Events include a children’s carving contest, wine tastings, and an ice skating performance. There is no charge for most happenings. Ottawa’s Winterlude winter carnival may not be quite as big as Quebec City’s, but Canada’s capital city does boast the Guinness World Record for the world’s largest naturally frozen ice rink, the 4.8-mile-long Rideau Canal Skateway. During Winterlude, the Skateway is the focal point for many of the events, including the Winterlude triathlon and evening music performances at American Express Snowbowl. Skating along the canal, stopping off for hot drinks and “beaver tails”—the Canadian version of fried dough—is also a popular activity. Confederation Park in downtown Ottawa hosts an international ice-carving competition, and Jacques-Cartier Park across the river in Gatineau is the site of the snow-sculpting competition and the Snowflake Kingdom, a snow playground with more than 30 snow slides. Most activities are free, although some shows and sporting events may charge a fee. More than 250 of the world’s best “extreme” skiers, snowboarders, and other winter sports athletes gather at Aspen Snowmass to compete in 16 different events during the ESPN Winter X Games this January. Some of the notable athletes who have been invited to compete include gold-medal-winning snowboarder Shaun White (aka “The Flying Tomato”) and silver medalist Lindsey Jacobellis. All the events are free to the public, including the fan-favorite SuperPipe events and the Skier and Boarder X races. There are also autograph signing sessions and, on the 27th, a free Apres X Concert in downtown Aspen, which will feature top national acts. Each winter, the classic New England ski town of Stowe, Vermont, holds the down-home-style Stowe Winter Carnival, which focuses more on small-town community bonding than spectacle. For example, visitors are invited not just to watch but also compete in the Carnival’s Super-G Schuss ski race at Stowe Mountain Resort and play in the Snow Volleyball tournament. The culmination is the Village Night Celebration when Main Street is blocked off to traffic and opened to revelers for an open-air party and fireworks display. Ice carving, a kid’s carnival, and a screening of the Warren Miller extreme skiing film Off the Grid are also planned. Most events are free, but there is a charge to attend some of the town dinners and evening dances. To find other winter events happening around the world, check the event search engine on WhatsOnWhen. Festivals.com also has decent event listings.